Melissa Myambo, Veronique Tadjo, Elnathan John, Harriet Anena and Billy Kahora. 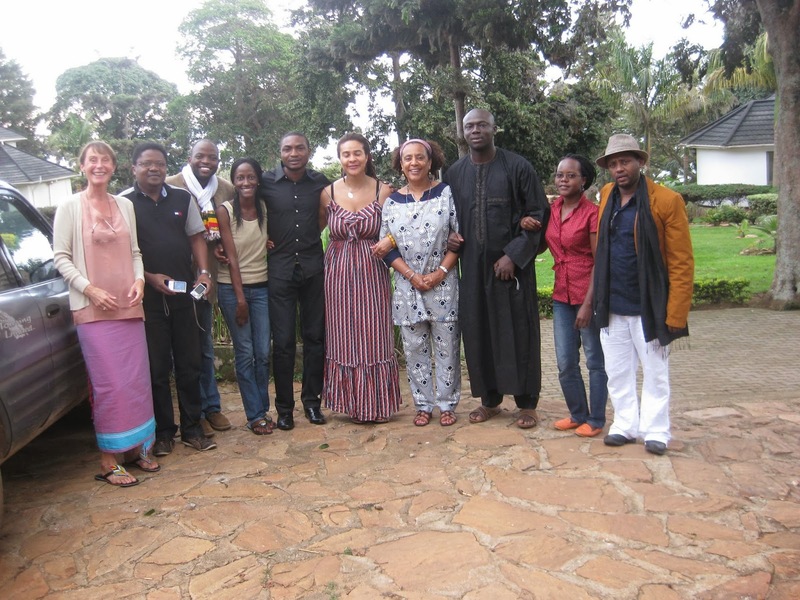 I just recently saw this lovely post from the people from the Caine Prize where they were hosting some of their 2012 and 2013 shortlisted writers to a workshop in Uganda not too long ago. 2012’s gang included Rotimi Babatunde (winner), Billy Kahora, Stanley Kenani and Melissa Myambo. From the class of 2013 there was Abubakar Ibrahim, Elnathan John, Davina Kawuma, Wazha Lopang, Hellen Nyana and Michael Phoya. After the end of workshop a collection of short stories, A Memory This Size and other stories, was produced which is co-published in 7 African countries. I am happy to see this happy kind of activity in the pearl of Africa. Our brothers and sisters from that part of the world have not been spared from that “literary desert curse” that Taban Lo Liyong spat of the region. But the country has been more than a desert. The old school of writers included Okot P’Bitek who is very famous for his Song of Lawino poem. The new school of beautiful writers include Doreen Baingana (2006 Commonwealth Writers’ Prize, best first book, Africa, and an AWP Short Fiction Award for Tropical Fish) and Monica Arac de Nyeko (winner of the caine prize 2007 for Jambula Tree). Also in that list is Jackee Budesta Batanda (Dance with Me won the 2003 Commonwealth Short Story Competition regional award) and Nick Twinamatsiko for his book The Chwezi Code. The countries writers haven’t rested on their laurels but have quietly been working on improving their capacity to write books that will amaze. The most interesting initiatives coming from that part of the world as far as I am concerned include Femrite, the Beverley Nambozo Poetry Prize and Writivism. Femrite is an NGO based in Kampala, Uganda, born in 1995 with a focus on developing and publishing women writers in Uganda so that the world can see just how good the next generation can. They have done very well for themselves. The Beverley Nambozo Poetry Prize was started in 2009 by Kampalan Nambozo to celebrate outstanding poetry and has gone on to do quite well. The newest initiative is Writivism which was born in Kampala last year and has had some success with local newspaper The Monitor supporting the initiative. The initiative has grown in the new year to include several other countries including Kenya, Naija, South Africa and Zimbabwe. With Jennifer Makumbi winning the Kwani Manuscript Project, a new literary prize for unpublished fiction by Africans, for her novel The Kintu Saga, you can tell that things are really looking up. Previous Previous post: Creative academy lecturer Billy Kahora working on new book.